Retke Road 32 car parks of the Regional Hospital from 25.07.2018. Parking is organised by Ühisteenused AS. You can pay for your parking using the mobile phone or the payment terminal. Mo-Su round the clock 1 euro per hour (0.5 euro per each started 30 minutes) and 4.5 euros per 24 hours. 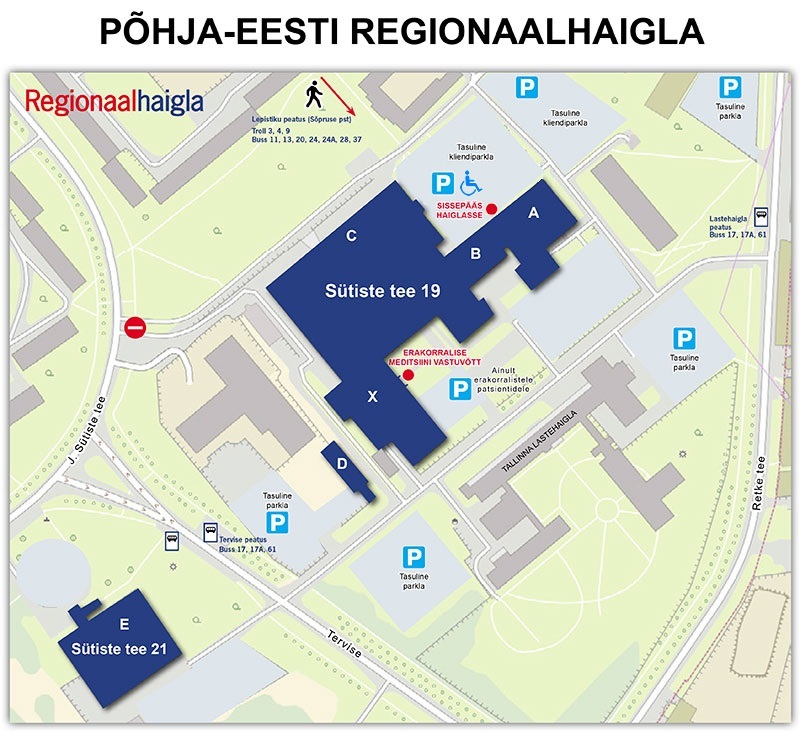 You can also use mobile parking via the PARGI.EE app. The mobile parking service is available only to clients of Estonian mobile network operators. One mobile phone number can be used to park only one car at a time. Please do not leave the vehicle until you receive the parking activation confirmation. In addition to the parking fee you will be charged the mobile network operator’s service fee (Telia currently charges 32 eurocents for any type of parking). 40 euros / 1 month. You can ask questions and submit problems to ÜHISTEENUSED AS on the short phone number 1669. Learn more on the www.parkimine.ee website. Parking is organised by the Regional Hospital. You can ask questions and submit problems by phone: 617 1789. The Emergency Medicine Centre car park can be accessed from the Children’s Hospital side. As you drive from Tervise or Retke Road and approach the hospital building, turn in via the road between the Children’s Hospital and the Regional Hospital, then at the illuminated sign turn again to enter the car park by the X wing Emergency Medicine Centre entrance. The car park has 22 standard spaces and 5 spaces for handicapped visitors. The car park with the barrier gate in front of the Emergency Medicine Centre is free of charge ONLY for visitors to the centre. Once in the centre and registering to be seen by a doctor, give the parking ticket you received from the barrier terminal to the registering staff member, who will mark it accordingly. When leaving the centre, insert that parking ticket into the payment terminal in the centre’s foyer. If the ticket was marked by a staff member, the payment terminal will quote the parking price “0 euros”. Alternatively, you can park the car at the car park with the barrier gate in front of the Emergency Medicine Centre for free for the first 15 minutes. This is sufficient time, for example, to drop a patient off or collect them from the centre in your own car or a taxi. In this case there is no need to mark/register the parking ticket. All others wishing to use the Emergency Medicine Centre car park must pay 4 euros per each started hour of parking. To finish parking, insert the ticket into the payment terminal in the centre’s foyer and pay for your parking as indicated on the screen. You can only pay for parking in cash and the payment terminal gives change. Parking beside other wings of the Regional Hospital is currently free of charge and in accordance with the particular car park’s traffic arrangements.